Rock hyraxes are distantly related to the elephant, dugong and manatee. The large, soft foot pads are moistened by secretions, making them more adhesive to climb up steep rock faces. They have 2 upper protruding front teeth that resemble an elephant's tusks and are used for defence. 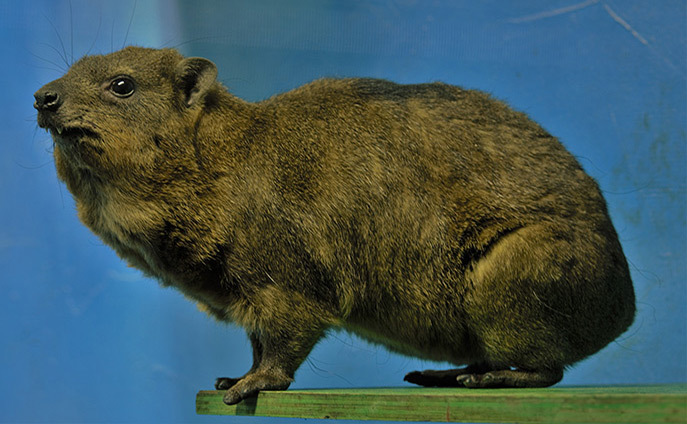 The 4 bottom teeth are used for grooming and cannot bite grass so the hyrax must turn its head sideways to graze. They produce hyraceum (a mixture of urine and feces) that dries to a rock-like consistency, and is used for traditional medicines and in the making of perfume.